Do you have back pain? Before incriminating your mattress or box spring, think about your pillow. A person usually forgets about this, but his action is the capital for the comfort, as well as your health. And that’s why: muscles relax at the night. A good pillow will support your cervical, while a bad one will transform this relaxation into contraction… Hence the pain from the awakening! 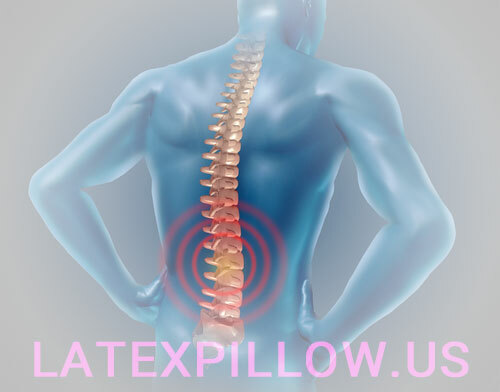 Here are the criteria to consider when choosing a new pillow for back pain relief. Some prefer to sleep on their backs, others on the side or stomach. Each sleeper has his favorite sleeping position! It is therefore important to consider this criterion before equipping yourself. Know that if you suffer from the back, it is best to avoid sleeping on your stomach… This arches you in the lumbar and twists your neck. If you can not break with this habit, prefer a flat pillow (thickness less than 4 inches) so as not to “break” the neck. Do you prefer to sleep on the side? This is a good position against back pain, but only if you have the right pillow! It should be firm and firm enough to fit snugly around your neck. Depending on the width of your shoulders, choose a model from 4 to 6 inches thick to meet the alignment of your spine. Finally, if you sleep on your back, you have more choices! However, choose a pillow that is slightly thick or even very thick: the higher the pillow, the better the respiratory comfort. The filling of the pillow plays an important role for your support. So choose a material that meets your needs, depending on your sleeping position and your budget. For example, if you want a flat and cheap pillow, polyester filler will be the good choice for you. Cost-effective, easy to compact and therefore should be changed every three years maximum. Conversely, wool pillows are very firm (sometimes a bit too much): an option to consider if you sleep on your back or side. The down and feather fillers are offer good support and a soft feel. Be careful though if you have sensitive nose you should buy a hypoallergenic model. Finally, a little bit more expensive and often more firm, the latex pillows always guarantee an excellent support to the sleeper. During the night, the head tends to descend down the pillow, which twists the neck and creates tensions in the cervical. The latest in the market, ergonomic (or anatomical) pillows, which take the shape of a wave, fit precisely in the hollow of your neck. Result: your spine remains perfectly straight even when you move. Be aware that they exist in thermosensitive version. Like memory foam mattresses, recommended for back pain, the latter take the imprint of your anatomy. The pillow deforms and adapts to your sleeping position on the back, on the side and even on the stomach. Therefore these two models are very effective in preventing the “disarticulation” of the head with respect to the rest of the body. Choosing an ergonomic pillow you can effectively relieve pain in the back, just like a memory pillow. You are ready to change your pillow. however if you do not have the right mattress, it will not prevent you from having back pain! So it may be time to look into the matter … And choose a mattress that really suited to your needs.